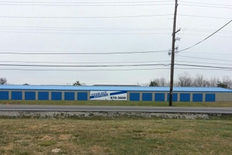 You’ll have all your storage needs met at Storage Express, which is located at 1162 Norton Rd. You’ll find us near Bolton Estates Apartments, Dollar General, and Wind Rush Apartments. 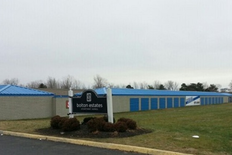 We’re happy to provide our clean, affordable units to both residents and businesses of our community. Our location makes us convenient not only to Columbus, but also to New Rome, Lake Darby, and other communities in the Columbus, OH metro. Come see us and we’ll help you get started! In our effort to provide you with the best self storage experience available, we’ve created a reputation for a safe, clean, and secure property that makes everyone feel at home and comfortable. Our wide, well-lit aisles are easily maneuvered so you can pull your moving vehicle right up next to your unit door. With sizes ranging from small 5’x10’ spaces to large 10’x25’ areas, we have something for everyone! Hi there! Thank you so much for your positive comments about Storage Express! Great place . Staff was very nice. We always strive to provide top quality service to every guest, and are pleased to hear that you enjoyed your experience here at Storage Express! Thank you for the high star rating, Jennifer! Good storage size. Easy access entrance. Reasonable price for the size. Everything we love to hear, Tiffany. Thanks for the opportunity to help with all your storage needs! Great Customer Service. Good Security. Clean and Friendly Staff. Nice Area to Store Your Belongings. Highly recommended. Crystal, thank you so much for the positive review. We are always more than happy to assist you if anything else comes up. Take care! This is a pretty good budget storage facility. There is a self-service kiosk where you can sign up, or you can call their phone number to do that. The facilities seem clean, and the drainage seems adequate. There is a lip of several inches from the asphalt to the concrete slab where the garage door is, but I have noticed water will get in under the garage door during a sideways rain or if water runs down the garage door, because that area of cement is not sloped. So you could end up with some water in your storage unit, and you should have your stuff in Rubbermaid containers. It seems to have a great deal of privacy, but not very good security over all. There is a sign-in gate code, but the door just opens when you want to leave so they can't really be sure when you leave or what units should be open or closed. There are no sensors on the garage doors to tell them what units are open at any given time, so if someone is breaking into your things they would not be able to send help. They do have video cameras up and good lighting. A nice bonus is that there is a light and light switch in the unit so you can see your things at night if you need to move things around during odd hours. I'm sure they wouldn't encourage this, but you can get an adapter at a hardware store that lets you plug a standard electrical cord into such an outlet. This can be useful if you want to put some ultrasonic mouse and rat repellent devices in the unit, which I did. Those emit a high pitched whine that discourages rodents from going in. That's a good thing, because the garage door can move as high as 2 inches off the concrete slab when locked, & a strong rodent may be able to push it up. I got a 10 by 10 at an introductory price of $45 for each month for 2 months, and after that the price would have gone up. It was easy to sign up and easy to move out as well , and the unit was clean when I moved in. 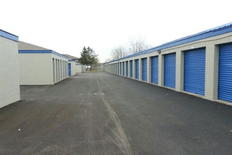 If you are looking for a budget storage facility, this is really pretty good.